The Instituto Nacional de Ecología y Cambio Climático (INECC) created the SINAICA website to gather the information generated by all the air quality monitoring stations located throughout Mexico. The pollution and meteorological information is generated by the monitoring stations run by the local authorities, who then trasmit it to SINAICA. 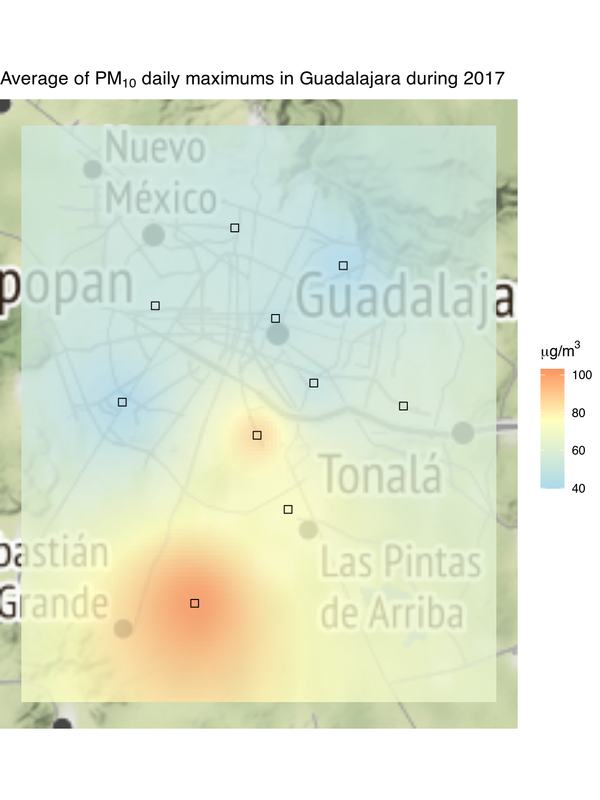 This R package provides tools for downloading that information, and in this example we’ll use it to create a simple map of PM10 pollution in Guadalajara. Both functions can download the crude real-time data as it comes in, the older and not as complete validated data, or pollution data which is collected manually and sent to an external for lab analysis. We’ll use the sinaica_station_data function to download pollution data for all the stations located in Guadalajara. 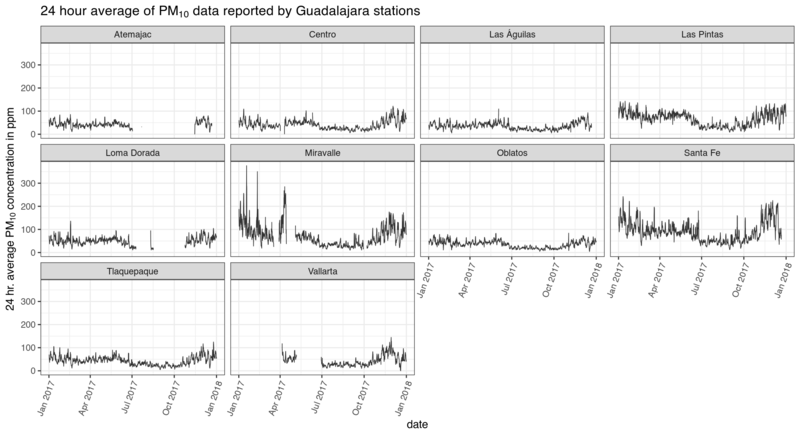 We’ll also use the crude real-time data since there is no validated data in Guadalajara for 2017, and ozone samples are not collected manually in any of the stations. Usually, for PM10 particles, a 24-hour average is taken as the current pollution value. #> Warning: Removed 3100 rows containing missing values (geom_path). 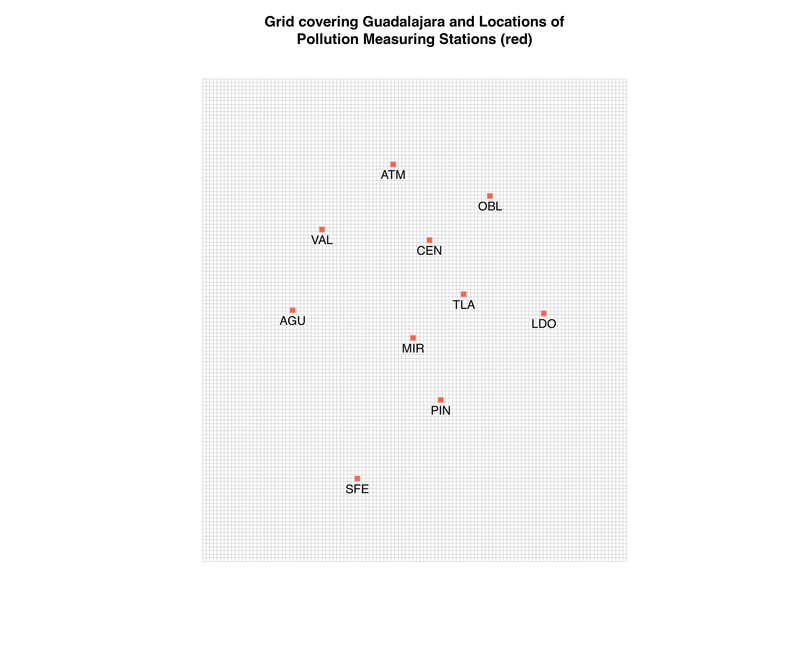 We will use the longitude and latitude data of the measuring stations in the stations_sinaica data.frame to create a grid covering Guadalajara, and then extrapolate the pollution values to each cell in the grid by inverse distance weighting from the values in the locations of the measuring stations. proj4string(geog) <- "+proj=longlat +datum=WGS84 +no_defs +ellps=WGS84 +towgs84=0,0,0"
Now that the grid is ready we can use inverse distance to calculate the pollution values in each grid cell. We’ll show on the map the average of all the daily maximums of the twenty-four-hour rolling average of PM10 values. Now we will use the package ggmap to plot the locations of the stations and the pollution grid on top of a map.